Let’s face it - this time of year is difficult for lovers of fresh, local produce. A majority of the farmers markets are closed, save for Dupont Circle, Eastern Market, Penn Quarter (until December 18th at least) and the one in Arlington; there are only so many things you can do with potatoes; and what the hell is this odd looking tuber thing in my CSA box? Believe it or not, there are still plenty of fruits and vegetables in season in the metro DC area. And I’m here to help you not only find them, but turn them into delicious, hearty meals. As I mentioned earlier, one of the biggest farmers markets open year round is the FreshFarm market at Dupont Circle. Open every Sunday from 9 am to 1 pm (the starting time switches to 10 am in January), the market is a wonderful source for local produce, meats and dairy products during the colder months. In December, you can find an assortment of potatoes, turnips, onions, carrots, beets and a variety of greens (from arugula to kale). While there are fewer vendors at the market during the winter, there are still more than enough from which to choose. Next Step Produce is a family-run farm in Charles County, Maryland that can still be found at the farmers market during the colder time of year. The husband and wife team of Heinz Thomet and Gabrielle Lajoie use organic farming techniques to grow vegetables, fruits, herbs and flowers that they sell not only through Dupont Circle Farmers Market, but also through a CSA in Vienna and directly from their farm. You can sign up to receive weekly lists of their harvested vegetables and place an order with them by a specified day. Arrangements are then made for the customer to pick up their order. Heinz and Gabrielle are also committed to teaching others about the benefits and techniques of sustainable agriculture. They offer people the chance to work on their farm, located just 50 miles outside of Washington, DC to learn the principles of responsible and conscientious farming. The Farm at Sunnyside is another year round vendor at the local farmers markets, thanks to their four season farm production method. Like Next Step Produce, The Farm at Sunnyside is a strong proponent of sustainable agriculture and using farming techniques that preserve the land for future generations. Located in Rappahannock County, Virginia, this certified organic farm sells in season vegetables, tree fruit and eggs from free range hens. Owned by Nick and Gardiner Lapham, the Farm at Sunnyside also operates a CSA (however, they are currently not accepting new subscribers) and sells their produce directly to restaurants in the Virginia, Maryland and DC areas. The farm’s idyllic location (at the foot of the Blue Ridge Mountains) also makes it a favorite farm visit destination for Virginians. You can find their products at Dupont Circle year round and at Penn Quarter Farmer’s Market until December 18th. I stopped by both Next Step Produce and The Farm at Sunnyside recently and picked up some carrots, sweet potatoes, celery and onions. Along with some garlic and thyme from my own CSA box, I decided to create a curried carrot and sweet potato ginger soup for my week’s lunch. Because all soup requires a stock or broth of some kind, I opted to use the abundance of vegetables from my CSA to create a vegetable stock for the soup. This is the perfect time of year to create vegetable stocks because there really is only so much you can do with carrots, celery and onions. You can then freeze the stock using freezer bags, a freezer hearty container or in ice cube trays. And since it’s winter, you will need a lot of stock for the many, many, many soups and pot roasts one inevitably makes when it turns cold. In a large pot, combine all of the ingredients and bring to a low boil. Reduce the heat and allow the stock to simmer for one hour. Remove from the heat and allow to cool to room temperature. Strain out the vegetables and herbs and store the stock for later use. In a large Dutch oven, heat the olive oil over medium high heat. Add the onions and sauté until tender (about five minutes). Add the sweet potatoes and carrots and cook for two minutes. Add the paprika, curry powder and ginger and stir to make sure the spices mix in with all of the vegetables. Add the broth and bring to a boil. Reduce the heat, cover the Dutch oven and allow the mixture to cook for 35 minutes or until the vegetables are tender. Add the salt and pepper and allow the mixture to cook for another 5 minutes. Allow the mixture to cool to room temperature. 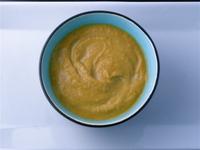 Working in batches, pour some of the soup into a food processor or blender and pulse until smooth. Repeat the same steps until all of the soup has been blended. Takoma farmer's market is open too! sundays 10-2 all year round, at the intersection of carroll ave and laurel street just up from the metro. Thanks for the tip Elizabeth! I will have to check it out! Gonna try making this with the turkey stock I made with the leftover turkey parts on Thanksgiving!